Lancashire Police has said that a 20 year old man from Preston has been arrested this morning (Monday, May 11th) on suspicion of a Section 47 assault and is currently in custody. 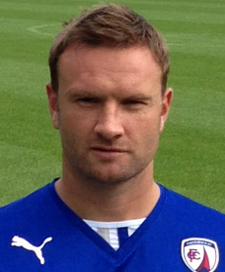 The force is continuing to investigate the alleged assault on Chesterfield player Ian Evatt (left), which followed an otherwise largely peaceful incursion onto the pitch at the end of the Preston v Chesterfield match at Deepdale on Sunday, May 10th. The player was thankfully not seriously hurt. Officers are continuing to try and identify anyone involved in the assault. They would like to thank those who have provided information so far and appeal for anyone with information or who witnessed the incident to contact police on 101 quoting log number 0835 of May 10th.